Length x Width Ohio is 220 miles long and 220 miles wide at its most distant points. Explanation The geographic center of Ohio is located in Delaware County, 25 miles NNE of the city of Columbus. Borders Ohio is bordered by Pennsylvania and West Virginia on the east. On the west Ohio shares its border with Indiana. To the north of Ohio is Michigan and Lake Erie. Ohio is bordered by Kentucky and West Virginia in the south. Total Area Ohio covers 44,828 square miles, making it the 34th largest of the 50 states. Land Area 40,953 square miles of Ohio are land areas. Water Area 3,875 square miles of Ohio are covered by water. Highest Point The highest point in Ohio is Campbell Hill. It's 1,549 feet above sea level. Lowest Point The lowest point in Ohio is the Ohio River. It lies 455 feet above sea level. Mean Elevation The Mean Elevation of the state of Ohio is 850 feet above sea level. Ohio's topography consists of rolling plains for the most part. In the north, Ohio borders Lake Erie. The Lake Erie Plains, part of the Great Lakes Plains, extend southward from the lake into Ohio. The Allegheny Plateau is located in the east. The Central or Till Plains cover the western portion of the state. The Great Lakes Plains: In the north, where Ohio borders Lake Erie, the land takes on the characteristics of the Great Lakes Plains. The Great Lakes Plains run along the Great Lakes from Wisconsin to Ohio. In northeast Ohio, the Great Lakes Plains, referred to as the Lake Erie Plains along Lake Erie, expand about ten miles south into Ohio from the banks of the lake. This fertile lowland widens as it rolls west until it is more than fifty miles wide in the Maumee Valley. The Till Plains: In western Ohio, south of the Lake Erie Plains, the Till Plains make their appearance. The Till Plains, with originations in Ohio, expand westward. This gently rolling landscape, interrupted by hills, is one of the most fertile farming regions in the United States. The Till Plains mark the beginning of the Corn Belt. One of the hills, Campbell Hill in Logan County, happens to be the highest point in Ohio; 1,550 feet above sea level. From this high point, the land gradually slopes downward toward the southwestern corner of the state and the lowest point in Ohio, the Ohio River. The Appalachian Plateau: The Appalachian or Allegheny Plateau covers the eastern half of Ohio, south of the Lake Erie Plains. The northern part of the Appalachian Plateau consists of rolling hills and valleys. The southern two thirds of the Appalachian Plateau consists of steep hills and valleys and is the most rugged area in the state. The soil is thin; not very fertile. This portion of the state is blessed with beautiful scenery and Ohio's most abundant mineral deposits. The Bluegrass Region This region, spilling north from Kentucky, consists of hilly and gently rolling land. The Bluegrass region comprises a small, triangular area of land in southern Ohio. The soil is thin and not particularly fertile. Lake Erie Shoreline: The Ohio shoreline lines 312 miles of Lake Erie; from Conneaut in the east to Toledo in the west. The eastern shoreline consists of ten to eighteen foot clay bluffs. The wester shoreline consists of beaches of clay and sand. Highest Temperature The highest temperature recorded in Ohio is 113°, Fahrenheit. This record high was recorded on July 21, 1934 near Gallipolis. Lowest Temperature The lowest temperature in Ohio, -39°, was recorded on February 10, 1899 at Milligan. Average Temperature Ohio has cold winters and warm, humid summers with an average temperature of 52°, Fahrenheit. Monthly average temperatures range from a high of 85.8 degrees to a low of 15.5 degrees. Climate Average yearly precipitation for Ohio, from 1971 to 2000, is shown on this chart from Oregon State University. 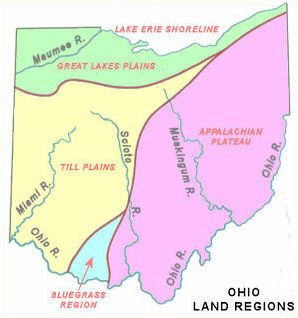 Richard J. Hopkins and Thomas W. Schmidlin, "Ohio," World Book Online Americas Edition, http://www.worldbookonline.com/wbol/wbPage/na/ar/co/400320, August 15, 2001.